Utah commissioner of agriculture LuAnn Adams looks on as Gov. 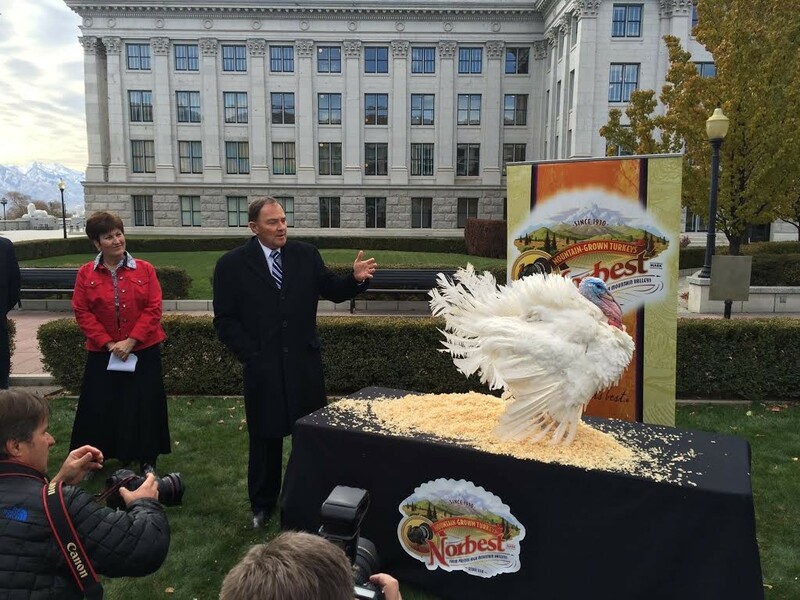 Gary Herbert pardons Norbert the turkey. For the fifth year in a row, Gov. Gary Herbert on Tuesday pardoned a Sanpete County-grown Norbest turkey, ensuring that the 47-pounder will not become part of the 16 pounds of turkey that state agriculture officials say the average Utahn consumes each year. The male turkey, called a “Tom,” is 23 weeks old. The man who grew the turkey, Trenton Anderson, who, with his father, Paul, runs PSA &Sons, a turkey farm in Moroni that grows 90,000 turkeys each year, says he picked the turkey out from a group of 18 of the best turkeys on the farm. On Tuesday, Nibbles was perched on a folding table at the Capitol, occasionally clawing at a pile of sawdust. Just before Herbert arrived, Nibbles relieved himself on the black table cloth, avoiding his sawdust bed. Whether Trenton liked it or not, Nibbles, through a naming contest, was renamed “Norbert,” an apparent homage to the company that will harvest around five million other turkeys this year, and the man who would be sparing the bird’s life. The turkey-pardoning ceremony gave Herbert and LuAnn Adams, commissioner of the Utah Department of Agriculture & Food, a chance to give a post-harvest cheer to the state’s farms. Adams told the crowd of mostly Sanpete County residents, many wearing Norbest jackets, that Utah’s $17 billion agriculture industry is going strong. Around 95 percent of the state’s 18,000 farms are family-owned—a statistic Adams drove home by pointing out that family-owned means a mom, dad, kids and grandparents. “The family farm is alive and well in Utah,” Herbert said, noting that Norbest employs around 500 workers. Before pardoning Norbert and urging the turkey to, among other things, “live long and prosper,” Herbert encouraged Utahns to think of the needy during the holidays. “There are people out there that need a little helping hand,” Herbert said.